Alberti gives this result without a reference, saying that the match was to be won by the first player to win 51 games, but that as of 29 Apr. 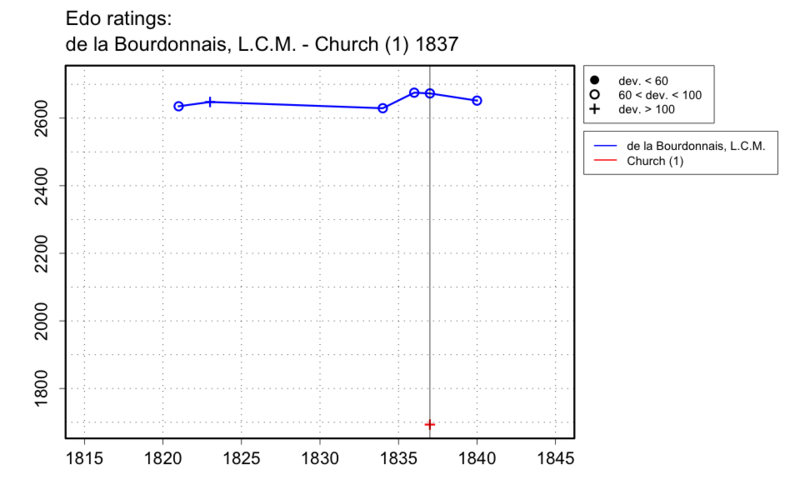 1837, de la Bourdonnais was winning 40-5, and Church then abandoned the match. References apparently to this match appear in Le Palamède (1837, p.45,84), not giving the name of de la Bourdonnais' opponent but saying that it was to be a match of 101 games, the first to win 51 being the winner. However, it also says that de la Bourdonnais would give odds of Rook, Pawn and Move, which is not mentioned by Alberti, Spinrad or La Grande Storia degli Scacchi. Bell's Life in London (11 June 1837), also not giving the name of de la Bourdonnais' opponent, gives the final result as +51-6 for de la Bourdonnais, giving Rook, Pawn and Move, so apparently the match was not abandoned at +40-5. Alberti's source is apparently La Nouvelle Régence (Apr. 1863, pp.99-100) where Doazan recounts the story, at least up to the 29th of Apr. 1837, when he left Paris and only heard of de la Bourdonnais' victory in the first few days of May.